Pizza. Who doesn't love it? Why wouldn't you? Oh, I don't know, maybe because IT IS KILLING CHILDREN, YOU HORRIBLE MONSTER. A new study from the Illinois Prevention Research Center and published in Pediatrics found that kids are eating way too much pizza: it's the second-highest source of calories for kids between ages 2 and 18, and kids eat way more in sodium, calories, and fat on pizza days than on days they don't. Fully 20% of American kids are eating pizza on any given day, and if that number doesn't horrify you, get off my website, you shill for Big Pizza. Acute Pepperoni Toxicity Syndrome is no laughing matter. Every year, dozens of children  die from pizza overexposure, and it's time we stopped politicizing their tragic deaths, for unlike their murderer, their lives cannot simply be revived by microwaving them. Pizza apologists* would have you believe that "it's delicious" and that maybe the solution is for kids to "not eat an entire pizza in one go, wtf is wrong with parents who let them do this," but we know the truth. Amazingly, previous efforts to combat this threat by making pizza as disgusting as possible by topping it with pineapple have gone nowhere, as there exist human beings deranged enough to enjoy just such a monstrosity. 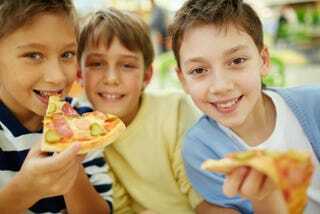 Kids need to eat pizza less frequently, but pizza needs to get healthier, said lead author Lisa Powell, associate director of the Health Policy Center at the Institute of Health Research and Policy at the University of Illinois at Chicago. "It's a very common and convenient food, so improving the nutritional content of pizza, in addition to reducing the amount of pizza eaten, could help lessen its negative nutritional impact," she said. Bleeding heart pizza moderates like this don't have the stomach to do what needs to be done: all pizza, everywhere, must be eradicated to save us from this scourge. Truly, desperate times call for desperate toppings. * This is to say nothing of pizzanatics that refer to all pizzas as simply "pies," who appear to belong to a weird cult known as "Long Islanders." If you are concerned about not being able to spot these dark cultists, you may know them by their inability to pronounce the words "pocketbook" and "beauty parlor."